No female Marvel superhero, but Sony weighs a female Spiderman and female Ghostbusters. 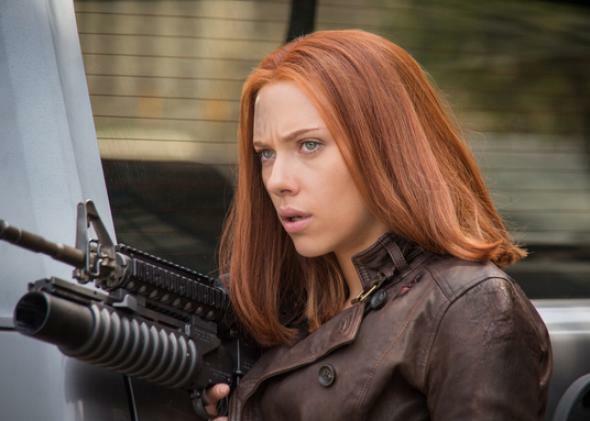 Why Do So Few Blockbusters Star Women? Marvel Blames the Sequel. Marvel’s Black Widow awaits her star vehicle. Leading ladies like Lucy, Tammy, Maleficent, and Tris are dominating the box office this year, but some studios are still making excuses for keeping female protagonists out of their blockbuster bids. The most recent defense proffered by studio executives who don’t favor stories about women: Hollywood is simply invested in producing sequels, franchises, and reboots of established films right now, and since the originals starred men, the spin-offs must star men, too. In other words: They can’t make movies with women because they never made movies with women. That’s funny: Just last fall, Marvel Studios was claiming that it couldn’t produce more than two films a year, and that’s why it can’t squeeze in any that feature women. “It’s hard because we have a small group at Marvel. We do two films a year,” Marvel Studios producer Louis D’Esposito said when asked a similar question about the lack of Marvel superheroines last fall. “To get those two films done and to do them right takes a lot of work and manpower. And female-power, obviously. To add a third film and to just put it in the slate right now is difficult.” Now, Marvel has apparently found a way to juggle the “difficult” task of releasing three films in 2017, and another three in 2018. Why is it so hard to make any of them about women? It’s not like the studio is lacking in source material. The Marvel Universe offers dozens of lesser-known superheroines who could anchor their own franchises, but so far, the studio has left them on the page in favor of elevating male heroes like Ant-Man and Doctor Strange. When it builds a new ensemble franchise—as it did with The Avengers and this summer’s Guardians of the Galaxy—Marvel has a lot of leeway to pick and choose its character slate, but it typically stacks the deck with men, ensuring that future spin-offs will also require male leads. As Sady Doyle notes, Guardians of the Galaxy could have featured many more female characters if it had just taken a cue from the comics: “[T]here are so many pre-existing roles for women in this story that, even if the filmmakers had wanted to stick to a five-person line-up for Guardians of the Galaxy, they could easily have filled all five slots with women.” Instead, of the five main characters featured in Guardians, only one is female. Similarly, the Avengers’ superhero crew features five men (Iron Man, the Hulk, Captain America, Thor, and Hawkeye) and one woman (Black Widow). Four of the male characters have already spawned Marvel film franchises of their own. Not Black Widow. And though Marvel Comics has now made Thor a woman in the books, the character will remain male on film. Sony, meanwhile, doesn’t seem to be suffering from Marvel’s franchise-induced bout of lady-phobia. The studio has just announced that it plans to expand its own franchise based on a Marvel comic, Spider-Man, by building a film around an as-yet-unnamed female character. And it’s reportedly in talks with Bridesmaids director Paul Feig to reboot the Ghostbusters films with a team of female parapsychologists. So far, that project is just an idea, but Deadline’s Mike Fleming Jr. is already cowering at the very specter of female ghostbusters: “Signing Feig would be great news for Kristen Wiig and Melissa McCarthy, and maybe Maya Rudolph, Rose Byrne and Rebel Wilson, but what about the rest of us?” Fleming writes. “The ones who feel a level of ownership of the classic 1984 guy comedy Ghostbusters … I feel slimed.” Casting Jonah Hill, Kevin Hart, or Vince Vaughn, meanwhile, would be fine by Fleming. For men who grew up viewing Ghostbusters as the original “guy movie,” watching women take over the Firehouse probably feels about as annoying as watching the pesky female politicians who are slowly gaining representation in Congress these days. But the group of chauvinists Fleming describes as “the rest of us” are actually an increasingly irrelevant demographic. For women who watched the film wishing they could see Sigourney Weaver suit up in a yellow suit, the female reboot presents a potentially lucrative fantasy fulfillment. As for all the boys and girls who were too young to catch the movie the first time around? For them, ghostbusters don’t have a gender.